medin Medical Innovations is a Munich-based medical device manufacturer that develops and sells innovative CPAP systems for newborns and premature infants treated in intensive care units. The company’s latest product development — medinCNT — was the result of a joint development project with Bürkert. In some cases, the breathing of newborns needs to be supported through intensive medical provisions. If the young patient shows signs of natural spontaneous breathing, the application of CPAP (continuous positive airway pressure) is usually the therapy of choice. This maintains the functional residual capacity of premature and newborn babies without the need for intubation, while ensuring an optimum supply of oxygen and training the relevant muscles. Independently operating mobile systems are becoming increasingly popular in delivery rooms, ambulances and intensive care units. To address and tackle the considerable technical challenges involved in developing such a system, such as the precise recording and control of required gas volumes, concentration and pressures required for the baby, medin turned to the experts at Bürkert. Utilising medin’s expert knowledge in respiration technologies for intensive care scenarios, engineers at Bürkert created a compact system solution with a modular control block to meet all requirements. At the heart of the innovative ventilation device is an electronic gas mixer which consists of a compact control block, the mixing and measuring equipment, fitted control electronics, valves and silencers. In addition, the system contains oxygen sensors, a pressure-relief valve and connecting threads for the air and oxygen inlet and for the outlet of the gas mixture. Thanks to Bürkert’s ultraprecise proportional valves, the gas mixer controls the oxygen concentration and the desired flow rate “effectively and efficiently”, according to medin Technical and Marketing Manager Paul Schmitgen. The valves offers frictionless operation, combined with fast response times, dynamic performance and high repeat accuracy of ±0.25% — even more precise than the maximum deviation of ±2% required by current medical standards. The result is a ventilation device that works without a compressor, thanks to the built-in turbine. Since it only needs to be connected to an oxygen cylinder instead of a central gas supply, the independently operating, compact device is transport-friendly and thus suitable for mobile use. 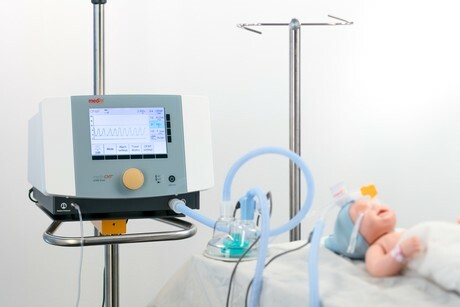 Bürkert has thus contributed to an efficient therapy solution for young patients, making sure their lungs receive the support they need for a good start in life. Please follow us and share on Twitter and Facebook. You can also subscribe for FREE to our weekly newsletters and bimonthly magazine.